When folks hear the word Xeriscape many times they picture a hot, dry area lacking lush plants and grass. The truth is Xeriscape provides the best way to grow plants while conserving water. Xeriscape is derived from the Greek word xeri for dry (needing little water) and embodies the principles of water conservation through creative landscaping. To employ the fundamentals of Xeriscape, the first step is proper plan and design keeping water conservation top of mind. 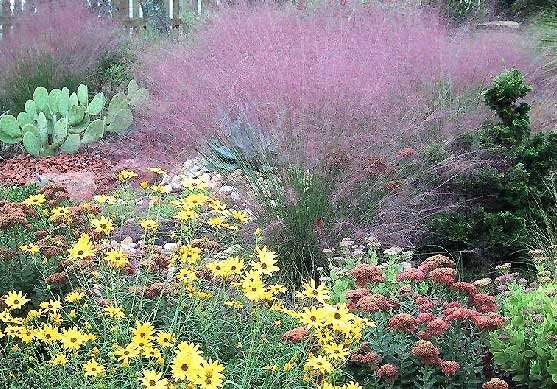 Both native and non-native plants will perform well in a properly planned Xeriscape landscape. While true drought-tolerant plants will thrive, all plants can grow when placed in the proper environment. The secret is grouping plants with similar water needs together o create different water use zones. The use of soil amendments such as compost or manure provides nutrients, promotes stronger growth, and allows better water absorption. The addition of mulch reduces evaporation, keeps the soil cool, and reduces weed competition for water, space and nutrients. Mulching also helps capture rainwater by allowing hard rains to soak into the soil instead of running off into the street and drainage areas. Grassy areas or turf can be included in a Xeriscape as long as it is properly managed. Limit the size of lawn areas and use the correct species of turf for the climate. Using native grasses or ground covers allow for controlled water usage and contribute to the beauty of the gardens. Water conservation is a critical consideration in today's gardening. Planning and maintaining a Xeriscape garden is an ideal way to enjoy a beautiful landscape in a resource and water efficient way. Your local Cooperative Extension Service is a great resource for more information about Xeriscape. Happy Gardening.